The Honorable Minister of Defence General Mansur Muhammad Dan-Ali (retired) is scheduled to visit Chad at a later date within the week to hold a bilateral meeting with his Chadian counterpart General Daoud Yaya. A statement issued Sunday by Colonel Tukur Gusau, the Public Relations Officer to the Hon Minister of Defence said the Visit is in continuation of consultations with Minister’s of Defence of Multinational Joint Task Force (MNJTF) Troops contributing countries (TCC) which includes Cameroun, Chad, Niger, Nigeria and Benin Republic. 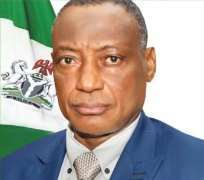 It may be recalled the Hon Minister paid a similar visit to Niger Republic in September 2018 during which he held a similar bilateral discussion with his Nigerien counterpart. The statement added that the Minister's visit to Chad will revolve around strengthening the operations of the Multinational Joint Task Force (MNJTF) to enable it achieve its mandate of eliminating security threats and creating a safe and secure environment in its area of responsibility.